Kimberley Ashlee Catering's first event was a wedding along the Virginia Beach Oceanfront in 2010. After years in Virginia sourcing the freshest ingredients from land and sea, we bring an emphasis to fresh ingredients to Pittsburgh. Our specialty in international cuisine allows us to create a unique menu and experience for our clients. And our state-of-the-art mobile kitchen allows us to provide you with an unstoppable menu at some of the city's beautiful event sites without limitation. Our non-stop drive to exceed our clients' expectations continues to push what we expect from ourselves. We pursue innovation, and look at culinary trends, ensuring your wedding to be unique and awesome. Our foundation in the catering industry began with years working for international hotel brands at the executive level. Therefore, you are guaranteed great attention to detail. Our team is extremely knowledgeable and is available you throughout the planning process. 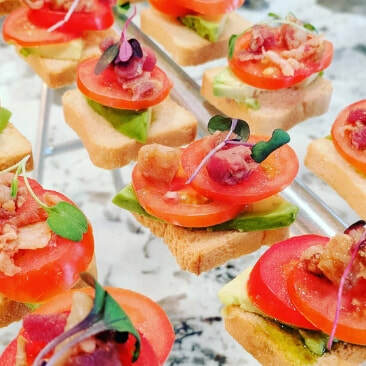 We are also capable of coordinating rental needs and will of course, provide you with an inspired menu ideas bring your vision to life so you can relax and enjoy your special day along with your guests! 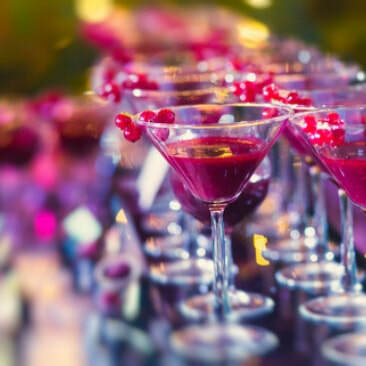 Work with our beverage team to create that signature cocktail or mocktail that will kick-off the festivities. Our certified sommelier will pair the perfect wines to your menu for an enhanced dining experience. Let's create a beverage package that suites your style for your day. This is your day! Our goal is to create a menu that emulates your taste and style. Would you like to celebrate your culture? Is there a special trip you took together where you loved a the cuisine? Let's translate who you are as a couple into the perfect menu that is at the same time approachable for a wide palate for all your guests. Special dietary needs? Not a problem. We've done a vegan, gluten-free pasta bar before. Planning an outdoor or partially outdoor wedding? What about having a food truck for cocktail hour? 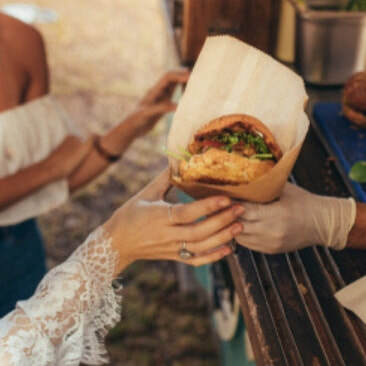 What about a food truck as part of your dinner as a fun food station or for your late night bite while your friends and family are partying? What if we told you that we could customize not only our food truck's menu but it's look too? You could have your own food truck roll into your wedding reception. Talk about wow-factor!